Every state can lay claim to having a most expensive restaurant or a biggest employer, and even a best band, but only one gets to hold the title of healthiest in the country. It may not be the sexiest distinction and won't get tourists scrambling to visit, but it definitely comes with bragging rights. So which state earned the top spot in 2017? And which one is now officially the least healthy? According to the latest annual report from America's Health Rankings, Massachusetts is the healthiest state for the first time in the 28 years it's been published, while Mississippi once again came in last place. To determine the ranking, the AHR team analyzed heaps of data from each state across 35 different categories including things like behaviors, community and environmental conditions, clinical care, and policy, factoring everything from drug deaths, to air pollution, obesity rates, and stats on smoking. 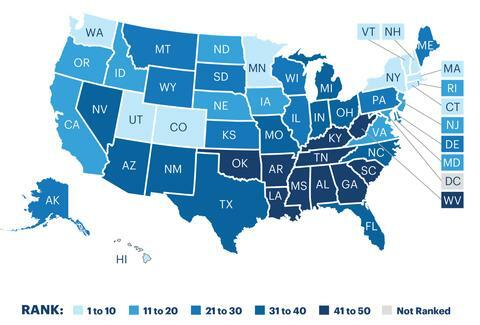 Here's how all 50 states stack up this year, from least to most healthy. Besides the ranking itself, the report includes quite a bit more intel on public health trends at large, many of which are pretty troubling. For instance, it found that for the third consecutive year, premature death increased nationally, and both cardiovascular deaths and drug-related deaths are up, even in the healthiest states. In fact, this year's healthiest state -- Massachusetts -- has seen a 69% increase in the drug death rate since 2012, and Utah -- the fourth healthiest in 2017 -- has seen a 10% increase in the cardiovascular death rate. However, there are some promising stats, specifically for states that have made huge improvements over past years. Both Florida and Utah managed to move up four spots in the ranking from last year, to 32 and 4, respectively. Kentucky, New York, Oklahoma, Rhode Island, and Colorado made similar strides each moving three slots closer to the top than they were in the 2016 ranking.